Borrowed from Watersheds:A Practical Handbook for Healthy Water, by Dobson and Beck and EPA Handout "Landscaping with Native Plants"
What is a Non-native Plant? Prior to the arrival of the first European settlers, the Midwestern landscape was made up of a variety of ecosystems, including tallgrass prairies, oak savannas, woodlands, and wetlands. These ecosystems were home to abundant birds, butterflies and other animals. Most of these areas have been transformed into the agricultural lands, urban centers, and industrial sites we see today. Few acres of the original landscapes remain. For example, approximately 65% of Illinois was originally tallgrass prairie. Today, less than 0.01 % of the original prairie survives in small, scattered preserves. Other natural ecosystems have fared similarly. What is a Native Plant?Native plants (also called indigenous plants) are plants that have evolved over thousands of years in a particular region. They have adapted to the geography, hydrology, and climate of that region. 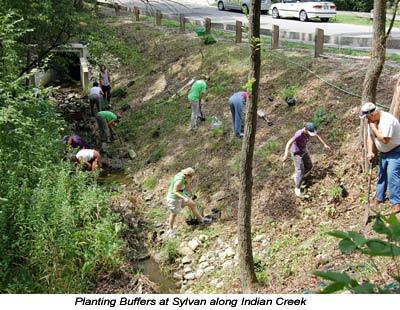 Native plants occur in communities, that is, they have evolved together with other plants. As a result, a community of native plants provides habitat for a variety of native wildlife species such as songbirds and butterflies. 1. Native plants provide a beautiful, hardy, drought resistant, low maintenance landscape while benefiting the environment. 2. Native plants, once established, save time and money by eliminating or significantly reducing the need for fertilizers, pesticides, water and lawn maintenance equipment. 3. 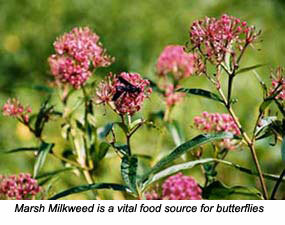 Native plants do not require fertilizers. Vast amounts of fertilizers are applied to lawns. Excess phosphorus and nitrogen (the main components of fertilizers) run off into lakes and rivers causing excess algae growth. 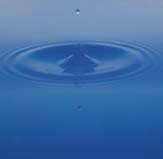 This depletes oxygen in our waters, harms aquatic life and interferes with recreational uses. 4. Native plants require fewer pesticides than lawns. 5. Native plants require less water than lawns. The modern lawn requires significant amounts of water to thrive. In urban areas, lawn irrigation uses as much as 30% of the water consumption on the East Coast and up to 60% on the West Coast. The deep root systems of many native Midwestern plants increase the soil's capacity to store water. 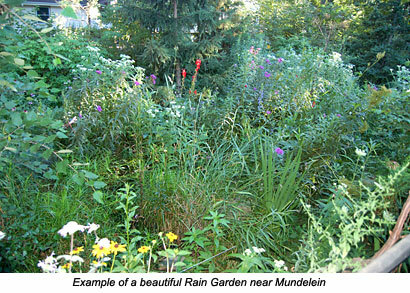 Native plants can significantly reduce water runoff and, consequently, flooding. 6. Native plant systems hold water and soil. Forests, wetlands, and prairie systems act like sponges, soaking up vast amounts of water and slowly releasing it into streams and groundwater reserves. Plant roots hold soils in place and when vegetation dies the nutrients replenish the soil. Natural landscapes do not require mowing. Lawns, however, must be mowed regularly. Gas powered garden tools emit 5% of the nation's air pollution. Forty million lawnmowers consume 200 million gallons of gasoline per year. One gas-powered lawnmower emits 11 times the air pollution of a new car for each hour of operation. Excessive carbon from the burning of fossil fuels contributes to global warming. Native plants sequester, or remove, carbon from the air. 8. 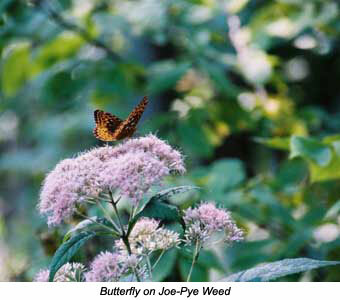 Native plants provide shelter and food for wildlife. They provide shade and relief from the heat. Native plants attract a variety of birds, butterflies, and other wildlife by providing diverse habitats and food sources. Closely mowed lawns are of little use to most wildlife. Native habitats are also good for people; native trees and other plants provide shade and reduce water loss from soil. 9. Native plants promote biodiversity and stewardship of our natural heritage. What is a Non-native Plant? Non-native plants (also called non-indigenous plants, invasive plants, exotic species, or weeds) are plants that have been introduced into an environment in which they did not evolve. Introduction of non-native plants into our landscape has been both accidental and deliberate. Purple loosestrife, for example, was introduced from Europe in the 1800's in ship ballast and as a medicinal herb and ornamental plant. It quickly spread and can now be found in 42 states. In general, aggressive, non-native plants have no enemies or controls to limit their spread. As they move in, complex native plant communities, wit h hundreds of different plant species supporting wildlife, will be converted to a monoculture. This means the community of plants and animals is simplified, with most plant species disappearing, leaving only the non-native plant population intact. Please be careful what you plant! For example, purple loosestrife colonizes wetland areas (it can produce thousands of seeds per plant! ), replacing native species unable to compete for available sunlight, water, and nutrients. 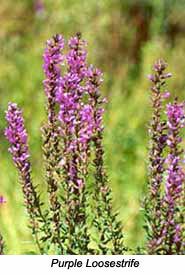 Wetlands infested with purple loosestrife lose as much as 50% of their original native plant populations. This limits the variety of food and cover available to birds and may cause the birds to move or disappear from a region altogether. There are many species like purple loosestrife (reed canary grass, European buckthorn, tartarian honeysuckle, garlic mustard, among others in the Indian Creek Watershed) that cause our native populations to get overrun and out of balance. Contact your county cooperative extension office or local land restoration contractors for help with controlling invasive species infestations.